We are very excited to announce that The Most Rev. Michael Bruce Curry, Presiding Bishop and Primate of The Episcopal Church, will join us at the 2017 VGEC Annual Conference in Atlanta, Georgia, on Friday, October 13th in service, in worship, and in conversation. He will celebrate and preach at the Holy Eucharist and his keynote address will highlight how vergers and all Christians might be led to take part in the Jesus Movement within the Episcopal Church. On Friday, October 13, 2017, the day will begin with Bp. Curry as we assemble in the lobby of the Marriott Marquis Hotel. At 9:30am he will walk with us as a group to St. Luke’s Episcopal Church - a walk of about one-third of a mile. Transportation will be provided for those who prefer not to walk. When we arrive at St. Luke’s, we will work in service project teams benefiting the Crossroads Community Ministries. This organization serves over 4,000 men, women and children each year who experience homelessness in Atlanta. One of the projects will be a “sandwich build” producing approximately three-thousand sandwiches to be distributed to the homeless. We will also work on other projects ranging from from cleaning to painting to whatever is needed. At noon, the Presiding Bishop will celebrate and preach at the Holy Eucharist in the nave of St. Luke's. Following the liturgy, he will join us for a fantastic late lunch provided and served by Crossroads. After lunch, he will give the conference Keynote Address and then lead the Bishop’s Forum, an informal question and answer session. After the forum, he will be available to autograph books and continue to visit with everyone. We will all then be free for the remainder of Friday afternoon and evening to explore downtown Atlanta. According to Scott Smith, President of the VGEC, "It is a true honor for the Vergers Guild of the Episcopal Church to welcome Bp. Curry to our 29th Annual Conference. He has been a strong supporter of the verger ministry for many years and it is so appropriate that he will be joining us for our day of service during the conference this year." In 2015, the Vergers Voice reported that when Michael was Bishop of the Diocese of North Carolina, his office produced a video called, "Please Note" with vergers Richard Parker, from Burlington and Mick Capon, from Durham at St. Philip's Durham. In that video, Bp. Curry made the observation that, "The verger is like a liturgical coordinator or conductor, sometimes visible and sometimes behind the scenes! This is sort of a liturgical concierge, a way of graciousness. I know when I'm traveling, it's so important for me to have someone to ask questions about a new place. That is a gracious and welcoming thing and it is at the heart of this ministry isn't it?" He closed the video by looking into the camera and saying, "Really, the ministry of the verger is the ministry of a concierge in the church." The Most Rev. Michael B. Curry was installed as the 27th Presiding Bishop and Primate of The Episcopal Church on November 1, 2015. He was elected and confirmed at the 78th General Convention of The Episcopal Church in Salt Lake City, UT, on June 27, 2015. He is the Chief Pastor and serves as President and Chief Executive Officer of the Domestic and Foreign Missionary Society and chair of the Executive Council of The Episcopal Church. Born in Chicago, IL, on March 13, 1953, he attended public schools in Buffalo, NY, and graduated with high honors from Hobart College in Geneva, NY, in 1975. He received a Master of Divinity degree in 1978 from Yale Divinity School in New Haven, CT. He has furthered his education with continued study at The College of Preachers, Princeton Theological Seminary, Wake Forest University, the Ecumenical Institute at St. Mary's Seminary, and the Institute of Christian Jewish Studies. He has received honorary degrees from Episcopal Divinity School, Sewanee, Virginia Theological Seminary, and Yale Divinity School. Throughout his ministry, Bp. Curry has been active in issues of social justice, speaking out on immigration policy and marriage equality. He has a national preaching and teaching ministry, having been featured on The Protestant Hour and as a frequent speaker at conferences around the country. He is married to the former Sharon Clement, and they have two daughters, Rachel and Elizabeth. He has authored numerous publications including columns for the Huffington Post and the Baltimore Times. His most recent book, Songs My Grandma Sang, was published in June 2015; Crazy Christians: A Call to Follow Jesus was his first book, in August 2013. Both books will be available for purchase during the Atlanta Conference. Register now to join us for the 2017 VGEC Annual Conference on Thursday, October 12, 2017 through Sunday October 15, 2017 in Atlanta, Georgia. You'll be worshiping, in community, at churches throughout the city of Atlanta. Unbelievably low conference hotel rate - if you act soon. Did we mention that flying to Atlanta is EASY? Atlanta's Hartsfield-Jackson International is generally known as the world's busiest airport, serving more than 260,000 passengers daily and 950,119 flights each year. Delta Air Lines flew 75.4% of the airport's passengers in February 2016, Southwest flew 9.2%, and American Airlines flew 2.5%. Abstract: The Most Rev. 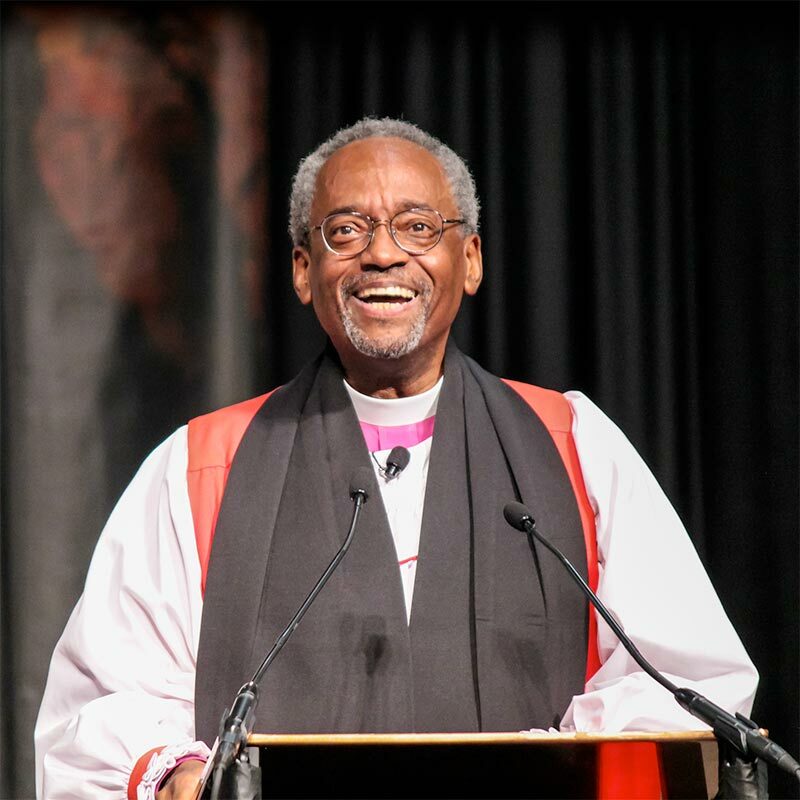 Michael Bruce Curry, Presiding Bishop and Primate of The Episcopal Church, will join us at the 2017 VGEC Annual Conference on Friday, October 13th in service, in worship, and in conversation. We hope you will join us, too!